Pav Bhaji is a delicious hot and spicy Indian street food, served piping hot by vendors in many Indian streets. 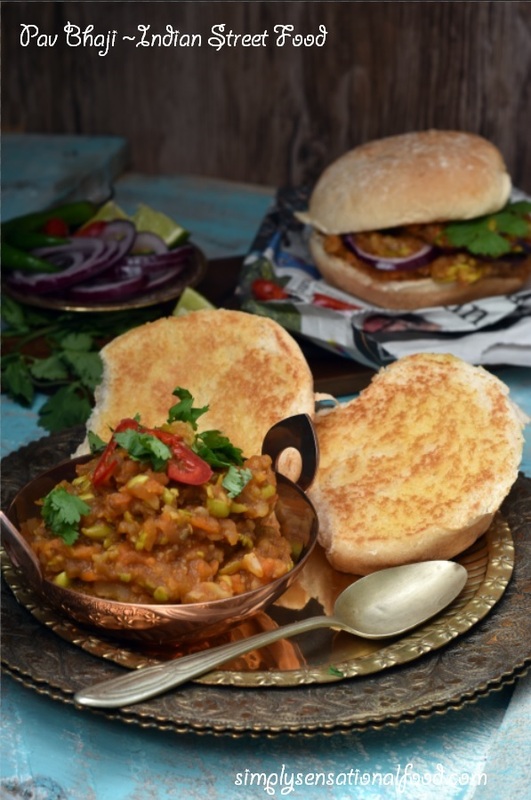 It is a blend of vegetables cooked on a open griddle with fragrant and aromatics spices called bhaji .The spicy bhaji is served hot topped on top of a soft pav which are soft bread roll cut in half and buttered and then toasted. The pav bhaji is garnished with chutneys and onions and served a with a squeeze of lime juice and a chilli pepper if you dare. It is a perfect meal in one, Indian street food at its best. I first tasted this delicious street food snack when I visited India some 10 years ago. Much to my hosts amusement, I had tears rolling down from my eyes from the spiciness of the bhaji but despite that I can still remember the amazing taste. I have recreated this awesome Indian street food although I have toned down the spice levels considerably. It is a blend of vegetables cooked on a open griddle with fragrant and aromatics spices. 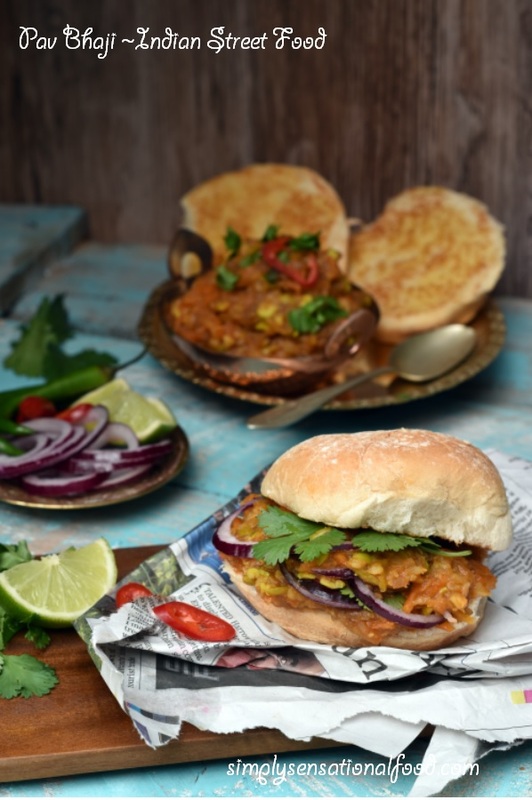 The spicy bhaji is served hot topped on soft pav which are soft bread rolls cut in half and buttered and then toasted toasted . 1. In a large steamer bowl add the diced potatoes, carrots, cauliflower, aubergines and coarsely ground peas. Steam all the vegetables for 20 minutes until well cooked.2. Mash all the steamed vegetables using a potato masher.3. In a pan add the olive oil and heat it, add to the the garlic and saute for a few seconds, next add the ginger and finely chopped chillies and the passata.3. Add the salt chilli powder, pav bhaji masala and cook the tomato mixture until all the spices infuse into the tomatoes.4. Add the mashed vegetables together with 60 ml of water and mix all the tomato spice mixture thoroughly into the vegetables. Cook the vegetables on a low heat mixing intermittently for about 10 minutes until the spices are well infused into the vegetables and they have broken down fully.The mixture should not be totally dry.5. Take the mixture ff the heat and garnish with the chopped coriander.6. To serve the pav bhaji cut the bread rolls in half and butter them with the sunflower spread. Heat a griddle pan and when it is hot add the bread rolls buttered side down so that the bread starts to toast and you get a lovely caremelised buttery flavour to the rolls.7. Remove the bread rolls from the griddle and place them on a serving plate. Top the Pav (toasted bread rolls) with the bhaji(the vegetable mixture) and garnish with the thin onion slices, chutneys, and red chillies. Green Coriander Chutney. These chutneys are also available ready bottled in most Asian supermarkets and also world food section in all large super markets. The Pav Bhaji Masala is available in most Asian Super Markets and it is an essential part of the recipe to give it the authentic street food taste. Wowwwwwwwwwwwwwwwwww.. looks perfect dear.. mouth watering clicks !! Love that street food! Must be a real treat there! Mouthwatering pavbajji.. luks delicious and very tempting click.. Thanks for visiting and commenting on my blog. I love the diversity of food and flavors on yours. So many new possibilites to learn from. same pinch..I made too pav bhaji just two days ago..kids wants to eat everyday something chatpata, and I don't want to make chapati.lol..yours looks really tempting and tasty ! Only had it in restaurants..wanted to try it ..Now will !!! That's really tempting..my favorite too. Who can say no to this heavenly street food.. Yumm..
Pav Bhaji is something I think of first when I have guests for tea. An easy and filling meal. Your dish looks delicious! The Pav bhaji looks very tempting. I must make some soon. I am drooling all over...haven't tried it at home so far. But guess I will. Yummy! I love pav…I can have it anytime and anywhere! Your version looks so good! All time favorite Pav bhaji looks awesome! ooh all time fav chat item. this version is nice. Just made the bhaji and in the process of making the Pav. My recipe is very similar to yours and I'll post the photo soon!! Good dish to make when you want to clear out the fridge and freezer. Wooooooooooooow wish i had this right now. Looks so so temptingly delicous. My daughter and I were just talking about street food and how we wish we had more available in our small town. Thanks for sharing. the first pic looks very tempting.... u've a wonderful space..
Looks really good, jam packed with some nice spicy ingredients yum! This recipe sounds amazing, I've bookmarked it! This sounds so tasty - I love street food, will have to have a go at this! Oh this looks very tasty, perfect food for the upcoming season change! This does look absolutely amazing and if I could find Indian street food like this near me, I would be a regular customer! Gorgeous - I've never tried this but would love to give it a go. Mmm! This looks delicious! I've never tried anything like it, but its looks tasty! Now this would be fun to try. I'm not too familiar with Indian street food so this would be exciting. I am a big fan of street food, and anything that has a ton of spices in it, like this, is good with me. I could almost smell that through my screen, it looks amazing. Hope to find something like this when I get to India one day! Wow, what a delicious recipe! They look amazing, I will have to try! omg I love indian food. it's my fav so i must try this. This looks like a wonderful recipe, i would love to give this a try myself. The pictures look yummy. It is a yummy and filling snack.. we usually have it for lunch or dinner. I love street food and love that it's become really popular. This looks tasty! That looks absolutely lovely.i love cooking all different types of food and definitely think I shall give that a go! I love appealing street food and the sort of food that brings tears to your eyes is even better. Indian cuisine is my absolute fav. This looks so delicious! I first thought that these were burgers! I love Indian food and would really love to try this! I love the sound of indian street food. Although i would have to tone down the spices too! Yummy Pav Bhaji!Drooling over this!